Charlie Higson talks about zombies, horror and scaring children in an interview I did in 2011 for the discontinued FrightFest e-zine. I can’t seem to find this on the net any longer, and its quite interesting – especially in light of the minor controversy caused by US film critic Matt Zoller Seitz showing Aliens to a slumber party of 11 year olds (for the record – in my opinion a rather stupid thing to have done). Charlie Higson: former punk rock singer; actor; comedian; author; a man of many talents. Higson is probably still best known to over thirties as co-creator and co-star of the BBC TV sketch show The Fast Show (1994-2000), but for a younger generation he is one of Britain’s best known authors of ‘Young Adult’ fiction. After publishing several adult novels to mixed success (including the crime novel King of the Ants which was filmed by Reanimator director Stuart Gordon) Higson found literary success writing for younger readers with the wildly successful Young Bond series (a gig he got only after being selected and vetted by Ian Fleming’s estate). 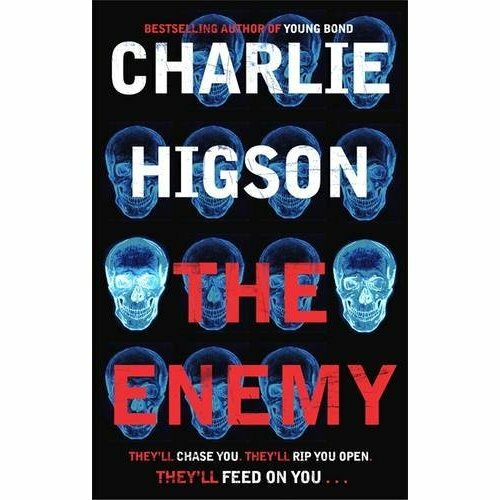 In 2009, he published The Enemy the first in a series of zombie novels for kids (although they aren’t really zombies, but more on that later). At the time of this interview in 2011, the third book in the series The Fear had just been published. The series is to conclude this year with The End, its seventh instalment. What was the origin of the idea for The Enemy? One [is] my obsession with zombies ever since seeing Night of the Living Dead… it had a big effect, it really frightened me and instilled in me a love of zombies which I still have. I still find them the most frightening of the horror villains. [Second was a] fantasy I had as a child of a world without adults. Wouldn’t it be great if the adults all disappeared and you had the run of the place, all to yourself? You could drive your own car into London and live in Buckingham Palace. Or go to the Imperial War Museum and play with all the guns, the weapons and stuff. Or go to the Tower of London and dress up in amour and clank about. So that idea of a world of kids… and the enemy they have to fight off is adults, and they’re zombies. It struck me there was a lot in there. Nonetheless, they are not exactly zombies are they? No they are not zombies… the creatures in the books do behave like classic flesh-eating zombies, but they are not dead bodies that have come back to life, they have been hit by a disease like 28 Days Later. But actually, textbook voodoo zombies are not dead either, that’s someone who appears to have died, or believes they have died, and then is resurrected as the mindless slave of the voodoo priest. How do you approach writing horror for children? We did a launch [of The Enemy] I was talking to the kids, asking them if they had seen any really scary films. This tiny girl came through. She looked about eight. I said to her “have you seen any really scary films?” She said “yeah”, I said “what’s the scariest one you’ve seen?” And she said “Saw”. She was with her mother, I looked up and her mother said [tutts] “yes I’m afraid so, I’m afraid she has seen Saw”, I said “you’ve seen Saw?” She said “yeah, it was really scary, there’s a really scary clown in it!” That was what had scared her, it wasn’t the dismemberments it was the [Jigsaw doll] had really freaked her out, the rest of it was just fun and games, but the clown stuck with her. [In the 1970s] you’d watch films and think “this has actually been made by people who are seriously fucked up” [laughs]. They would have actors in them that you had never seen before and would never see again. You couldn’t guarantee the happy ending that tended to creep in to horror films after that. Night of the Living Dead is a perfect example. It has one of the bleakest endings of any film you could care to see. That for me is what made those films so upsetting, frightening and distressing. I wanted the books to be frightening for kids, I really did want to frighten kids. When I was writing the James Bond books I’d occasionally have kids come up to me at signings and say “I really love the books, they’re quite scary, but they’re never too scary because I always know James Bond is gonna be all right at the end”. So with these books I wanted to write about a gang of kids, so that we didn’t know who was going to live, and also to make it clear from quite near the first book that any of them could die. I’ve got to be careful now because that can become just as predictable… but there’s got to be that element of suspense. “Oh no please don’t kill that character”. Where do you find the characters for The Enemy series? They come from everywhere… I’ve got three boys, so I see a lot of them and their mates, obviously they’re very useful in terms of getting [characters] to speak properly, for them to resonate with a younger reader. But they are sort of variations on a theme. You pick a type, and try to flesh them out. I’ve very rarely based someone entirely on one person… the great thing about setting [the books] in London is that you can have this wide range of characters, so some can talk in contemporary teenage slang, others are from posher private schools and talk differently, and that helps to differentiate them. It goes back to my love of Greek mythology… Homer was very good at coming up with catchphrases. Which is what I’ve done on The Fast Show, you create a character, you give them a catchphrase as a way of identifying them, and you give them a very specific look. And Homer did that in The Odyssey. Some people have said the books are like The Lord of the Flies, but actually in a way what I was trying to do was the opposite because William Golding. I don’t think he really liked kids, and he thought they were horrible savages who left to their own devices would revert to this awful, primitive existence and savagery. My experience of teenagers, and seeing how they are, is they seem like perfectly nice people. Teenagers have been demonised in contemporary society. We are all told as adults that if we step out our front doors we will be assailed by gangs of teenage hoodies who will stab us and rip our hearts out. But I see my kids and I think, well they are not like that at all. [The children] are all in their own way trying to work out how to survive. How they can put society back in a way that they think is going to work best. They get polarised in these different areas. You have kids at the Tower of London who are very much setting up a military based organisation. You have the kids at the Houses of Parliament thinking “we need a new democracy”. We’ve got the kids at The Natural History Museum who think we need a society that’s ruled by scientists and thinkers. Then you have this character David at Buckingham Palace who basically thinks he should be king and tell everyone what to do. That’s going back to how Romero built all those levels of satire into [his] zombie films. It’s a kind of satirical look at England and how it works and different possible ways of running society. After the first book some people said “David at Buckingham Palace, he’s based on David Cameron isn’t he?” And I said, “well not really” but as people said that I thought, well maybe it would be quite funny which is why [in The Fear] I had David try and form a coalition with Nicola [the leader of the Parliament kids]… basically she’s Nick Clegg [laughs]. If you are about write horror you’ve got to write about what scares you. As a father, what scares me is fear of anything happening to my kids. And so I think that’s what I’m exploring in these books, the worst possible thing that could happen to a bunch of kids. But I did want it to be the kids who were the heroes and tell it from their point of view, it’s the adults who are the monsters. For people who know you from The Fast Show, it may shock them how little overt humour is in the books. I don’t read funny books. Very few have ever actually made me laugh very much. Traditionally the way of doing horror for kids, was to do it a bit tongue in cheek, a bit jokey, I wanted to be properly frightening and intense. I’ve tried to make them as funny as real life… I came to comedy by accident really, I met Paul Whitehouse and Harry Enfield, we got on well together and started doing stuff, and suddenly I found myself writing comedy… I suppose my books have always been a kind of counterbalance to that, in order to get all the other stuff out. So if I have a funny idea, I’ll put it onto the TV, if I have an idea about kids being eaten, that will go into the book [laughs].